Then, a week before we were to begin our journey, nine people were murdered at the Emanuel A.M.E. Church. Charleston was attacked. With few words exchanged, we agreed on our destination. We might find no more important time to show up – just to be present. And since we were in a position to do so, we had no choice but to be in Charleston. As we typically do when we travel together (going on 17 years of journeys), our group of four found a mix of historical tours, good food, and impromptu conversations with incredible people. We stay talking and learning and laughing. 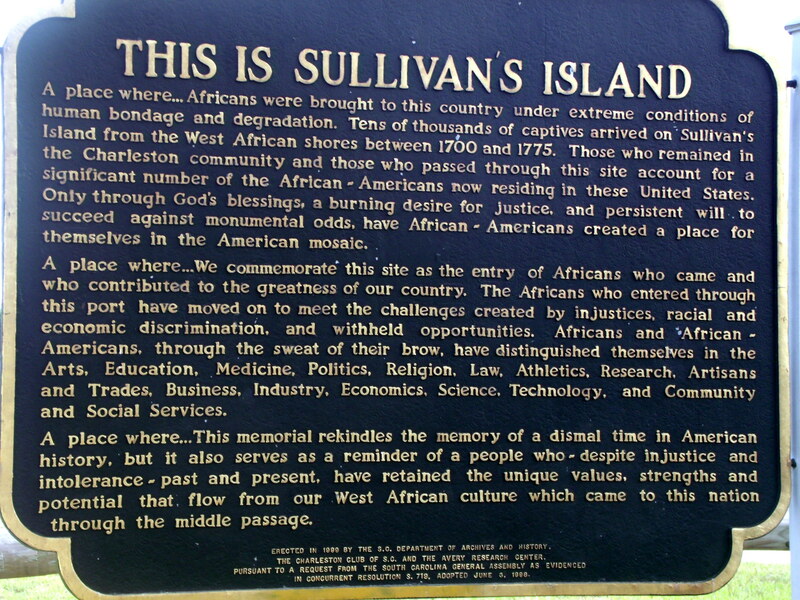 We spent some time on Sullivan’s Island, a major point of entry where up to 60 percent of enslaved Africans were brought into the U.S.
Not far from the Sullivan’s Island beach, we sat on The Bench by the Road. 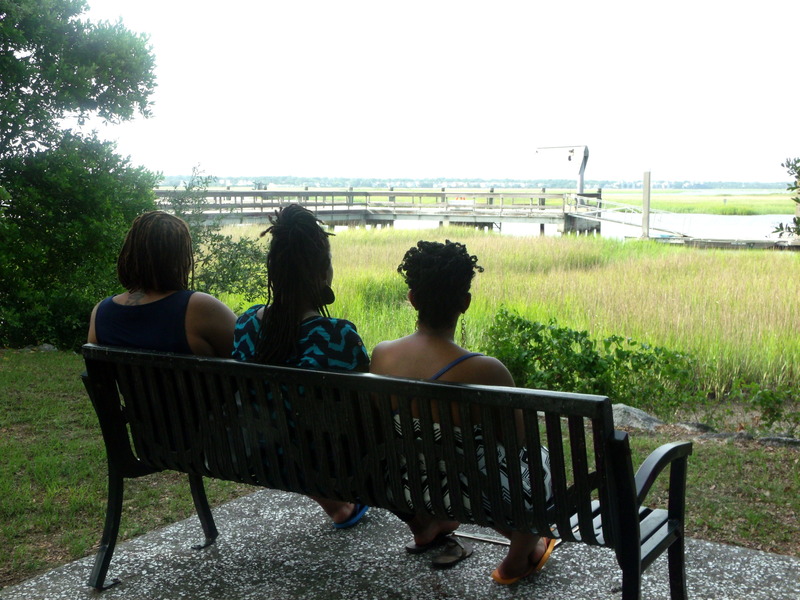 Dedicated by the Toni Morrison Society, this was our opportunity to sit, reflect, and honor the lives and souls of those who were enslaved. We visited the Emanuel AME Church. A mix of emotions. The following day, we lined up to attend the funeral of Reverend Clementa Pinckney. As we waited for nearly 3 hours under the sun, we stood among thousands of others who are fed up with being terrorized by maniacs, politicians, and police. We walked in a nearly single-file line, curving down the streets of downtown Charleston toward the TD Arena, holding pleasant conversations with each other, while remarkably resembling a modern-day civil rights march. We were turned away from the Arena when it reached capacity for the funeral (we were so close). So on our way to the overflow theater, where we would watch a live stream of the funeral with about 250 others, we returned to Emanuel AME. Since the front of the church was now barricaded off from public access, we asked a police officer to lay down the flowers we brought. He took incredible care to find the right location and proper placement of our flowers, as if they were his own. When President Obama delivered his eulogy for Rev. Pinckney, we stood on our feet and cheered among the roaring crowd. Tears of pain and joy were abundant among us. For more of my reflections on the day of Rev. Pinckney’s funeral, check out my piece on BET.com. Although my friends and I were only able to spend a few days in Charleston in late June 2015, we were there just long enough to be a part of history. This trip is going to stay with me for a long time – perhaps as a preview of the emerging revolution (which most likely will not be televised). Wow thank you for the post. I couldn’t be there but through your post I felt like I was there. I have now moved my trip to Sullivan island to the top of our destinations list. Thank you!! Thank you so much for informing me of your wonderful, learning travels.